These Fresh Mango Dumplings are best served with a tangy homemade lime syrup and a sprinkling of shredded coconut. 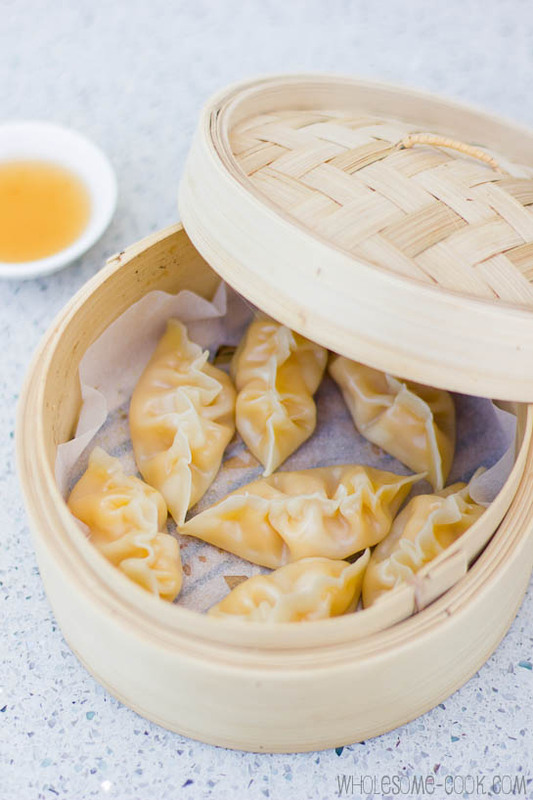 Steam like pot-stickers or pre-bake the skins for a crisp version. Dairy, nut and egg free. In Australia, you know summer is just around the corner, not when the temperatures rise above 30°C, but when you’ve just been to your local grocer’s and came home with a handful of mangoes for less than $5. This time is right about now. Just the other week, we were on our way to Bayview – one of the very few all-day off-leash dog beaches in Sydney when my keen foodie eye spotted yet another roadside stall sign: “Mangoes $16 a box”. Now that screams summer to me! I would have stopped but I’d already picked up a bucket of mangoes from our local Harris Farm at a similar bargain price, so we were kind of set for the moment. 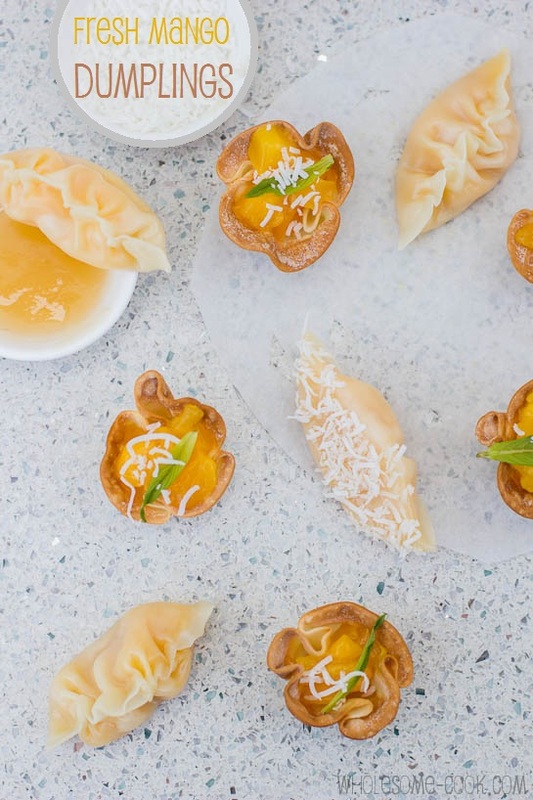 We love adding fresh mango flesh to salads, curries, yoghurt – even make mango and yoghurt ice pops with them, pancakes akin to those ones found at Chinese yum cha and, more recently, dumplings. Now I bet that sweet dumplings are not the first to spring to mind, but just like the 5 ingredient blueberry dumplings, these mango ones are certainly delicious and a great treat for afternoon tea, dessert or a summery supper. So tell me, dear reader, do you have your own way of telling that Summer is near? Or, for those of you in the North, what heralds the seasonal change to Fall for you? Recipe notes: For the steamed version, I’ve basically just used mango flesh and preservative-free gow gee wrappers. For the crisp dumplings, I used the same pastry but baked it in a hot oven for about 5 minutes, using a mini muffin tin. To balance out the sweet flavours of mango I made a sugar-free lime juice syrup and served the lot with some shredded coconut. Mint on the crisp version is optional, but a nice colour contrast. Cups can be pre-made up to 3 days ahead then filled when ready to serve. Steamed dumplings should be consumed straight away. Try to use preservative-free gow gee wrappers for this recipe. Mint on the crisp version is optional, but a nice colour contrast. Cups can be pre-made upto 3 days ahead and stored in an air-tight container then filled when ready to serve. Steamed dumplings should be consumed straight away. Place a gow gee pastry round in the palm of your hand and brush edges with some fresh water. 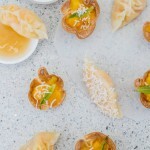 Place a heaped teaspoon of diced mango flesh in the middle of the round and fold the pastry as you would a taco, in half. Stick the water-brushed pastry together tightly, keeping the mango inside. Now working from one end of the dumpling to another gather the sealed pastry ridge to crimp up. Steam dumplings in a paper-lined steamer for 3 or so minutes for the pastry to cook. Serve warm with a side of the Lime Syrup and some shredded coconut. Place gow gee pastry rounds snugly into a small 12-hole muffin tin. Fill with pie weights or dried lentils. Bake in a preheated oven for 5 minutes or until the wrappers are starting to turn a rich golden colour. Remove from oven, tip out the weights and set aside to cool. 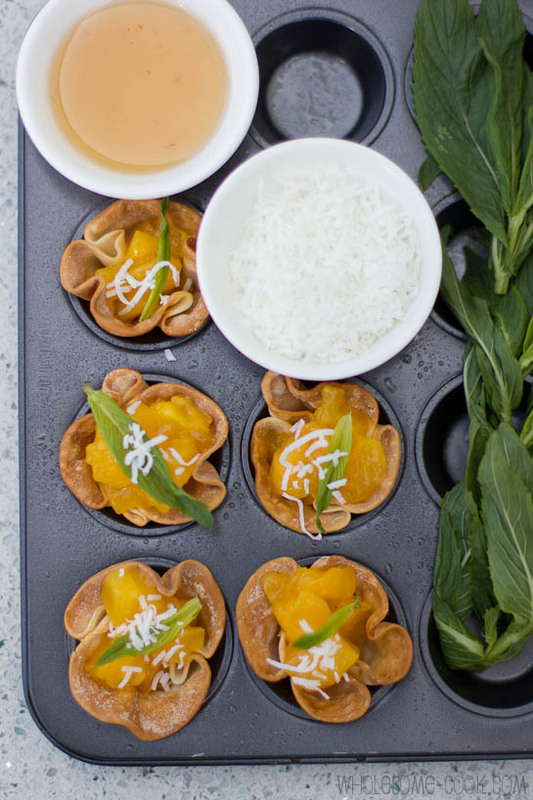 Once cooled, fill the pastries with finely diced mango flesh, drizzle with lime syrup and sprinkle over with coconut. Place lime juice and coconut milk in a small pan, bring to the boil over medium low heat. Reduce heat to low and cook for a further 5 minutes of so, until the juice has thickened into a syrupy consistency. Oh yummo! Lime. Coconut. Mango. HEAVEN! Saw this on Insta and have been refreshing your site since this morning. Love the double take on the dumplings! So simple too! Thanks for making these. And yes, mangoes = summer for me too. I love these! the baked version even more so! I love anything with mangoes. That’s the tropical girl in me. I have even made a pizza with mango-jalapeno topping. This looks so good. Loving it! You are the queen of simplicity Martyna. But everything you make that’s simple looks and I’m sure it tastes amazing. What a lovely presentation of the delicious mango! 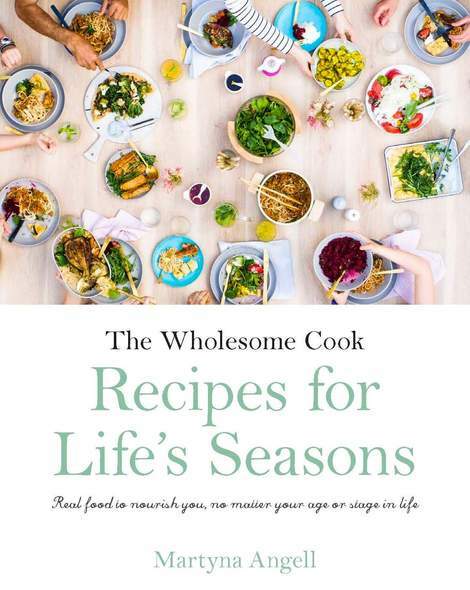 If I may, I’d like to invite you to submit your photos to the new YumGoggle, a photo sharing site with the philosophy that if you worked hard to cook it and photograph it, we should show it off! Hope to see you there soon! It’s been a gloomy cloudy rainy and cold couple of days in Londontown. I’ve just finished work and got home to find your email in my inbox. Thank you so much for cheering me up with these sunny dumplings. Oh what I would do to lay my hands on one right now. But since I can’t, I’m off to bed. It’s been a long and crazy day and that weather is definitely screaming Autumn to me! Night! Those look delicious! I used to have a mango tree right outside of my sliding glass door and I absolutely loved it! But alas, now I live in North Dakota and mango trees are almost non-existent! these look absolutely delightful. Looks perfect for that summer/spring snack on a hot sweltering day! So jealous of summer weather although we are having summer again this week. I need to save these for next year when mangoes are in season. What a great way to eat two ways – this is my first time seeing dessert dumplings done in two ways! Excellent post, Martyna!! Yay for mango season! I love both variations, I can’t decide which one I want to make first! 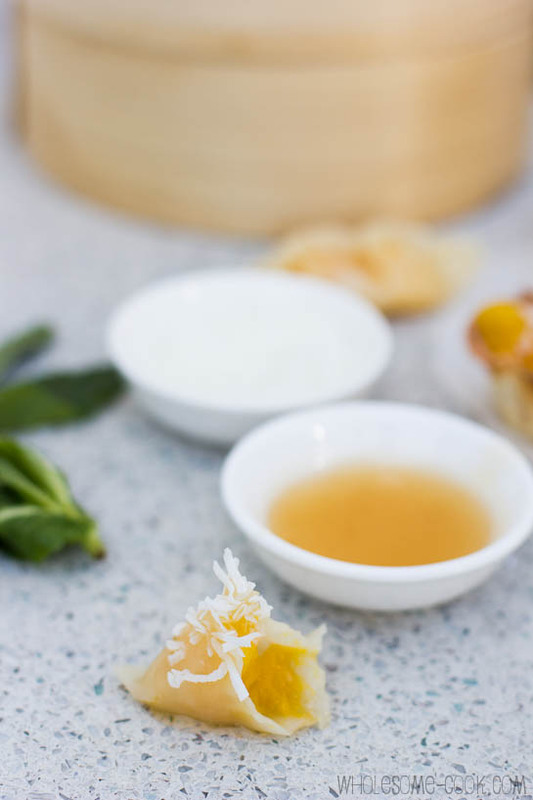 Steamed mango dumplings with lime and coconut – does it get any better? Yum! I just luuurve mangoes and have my eye on the pot sticker variety. Yes please! Ooooh yea! How cute do they look, So pretty and summery indeed. Crispy all the way for me. What wonderful recipes both of these are! I saw mangoes at the market today and got very excited about the prospect of Sydney’s coming summer. Wow I would definitely love this as mango is my favourite. 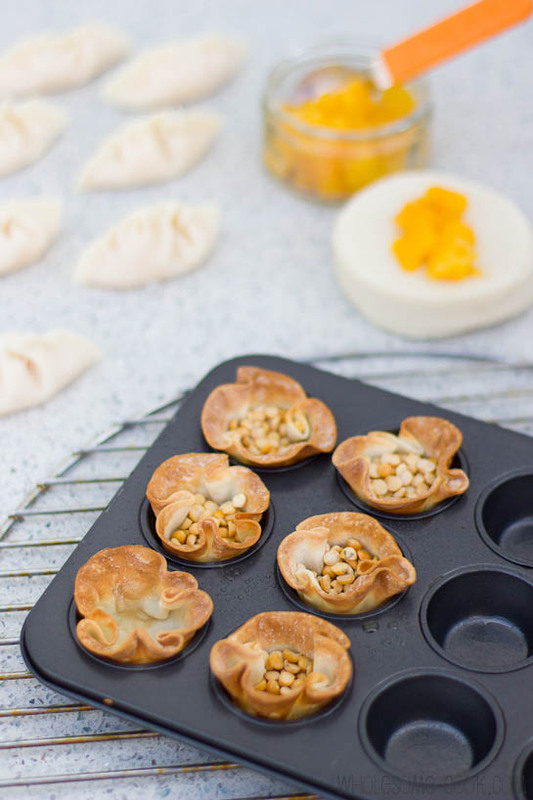 I love to read about your having summer somewhere far away… and these dumplings look very summery too. It’s the first time I see mango dumplings. Very appetising and very original. These mango demplings look amazing. What screams summer for me? I’m all about fresh foods, fruit, everything becomes just a little bit lighter.